It’s been a slow week. The Book Festival is long gone. The other Edinburgh festivals are finished. The cricket season ended last week, and the series against Bangladesh doesn’t start until next month. We don’t go away anywhere until towards the end of October. The weather is changing, making it sometimes more difficult to get out for bike rides and runs. In any case, I can’t persuade Fat Mac to get on his bike, the Tall Thin One is in Shetland, JD is in France, Lindsey is at work, it’s not long since I saw the TAK, I don’t see Donald until next week, I’m more or less up-to-date with adding journals to JournalTOCs, and it’s a slow, slow week. The most exciting thing that has happened this week is that I bought and fixed a new toilet seat. They don’t make toilet seats the way they used to. Somehow, the last toilet seat only lasted two years, which means that I am now spending about £1 a month on toilet seats. The last one got stained. The one before, which lasted three years, became lumpy as moisture got into the MDF. The one before lasted four years until it became wobbly. At this rate, replacing toilet seats will eventually become a major financial outlay. I can’t remember my parents ever having to replace a single toilet seat. Aye, they made them to last, in those days. Even Fat Mac has replaced his toilet seat recently (along with the rest of his bathroom). If I could persuade him to get on his bike, no doubt he would tell me about how toilet seats in the sivinties were far superior. But in terms of functionality, my new seat is a major improvement. Both the lid and the seat can remain in the vertical position, if you want it to. All previous seats came crashing down when you lifted them, due to the fact that the tank was too far from the wall and there wasn’t quite enough space for the lid and seat. I even got a plumber, who was called for another purpose, to look at the last-but-one seat, and he couldn’t get it to remain in the up position. But the new one has a different design, and stays in the vertical position, if you want it to. The new toilet seat was made in China, of course, and is formed from thermoset plastic, so shouldn’t go lumpy, and has rust resistant stainless steel hinges, fixable from the top, so shouldn’t go wobbly. It is ‘soft close’ which means that it doesn’t come crashing down, but as I said, this is less of a problem because it stays up, if you want it to. I also cleaned the front stoep and stairs. Having a clean stoep is a very African thing, and my stoep and stairs had become encrusted in grime, making it sometimes a bit slippy when wet. In fact, due to it raining every time I step outside, I’ve only cleaned the stoep and the top one-and-a-half stairs so far. Already, the ‘patio-cleaning-brush’ which I bought from B&Q for a fiver the other day has half fallen apart with some bristles coming off. Once I’ve finished, I’ll take it back to the shop as unfit for purpose. I’m not having stoep cleaning implements becoming as big a financial outlay as new toilet seats. A new toilet seat and a cleaned stoep. If it would stop raining, I could play golf. It’s been a slow week. The new Aldi store, McCarthy & Stone retirement flats, and care home at the western approach to Portobello are all gradually, or in the case of the Aldi store rapidly, taking shape. 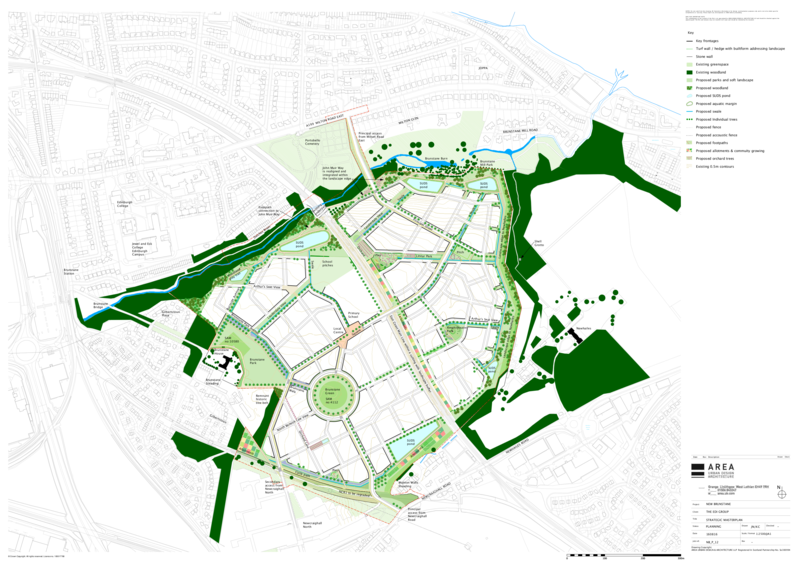 Barratt Homes have published details of their plan for Baileyfield South, quite near the new Aldi store, a proposal for 500 new homes. As I cycled south of Portobello the other day, I noticed how quickly the development at Newcraighall is progressing. Across the road from Newcraighall another new housing estate is being constructed, Balfour Park. If you look carefully in the background to the above photo, you can see the new-ish Queen Margaret University campus in the distance. Now, there is a Planning Application for a development of 1330 Homes, a school and roads, at Brunstane. Here is the proposed strategic masterplan. Above is the site of the proposed development at Brunstane, taken from the cycleway, which stretches to the grounds of Newhailes House. There is currently supposed to be a big shortage of new housing in Scotland, but the above, put together, are massive developments, all within one area east of the city. No wonder there are some protests. We took part in today’s Global March for Elephants & Rhinos. The route went from the Meadows down to Princes Street. There were similar marches in many cities of the world to draw attention to the plight of these wonderful animals. Every day around 100 elephants in Africa are killed for their tusks, and the rhino situation is getting critical. There are lots of berries on the bushes, just now. And no-one seems to be picking them. I took the above snap of berries near Musselburgh the other day, on the path past the River Esk floodplain below Inveresk. As you can see, if you look closely (click on the image), hardly a single berry has been picked. I like cycling that track because it takes me past the site of the Roman temple at Inveresk. It is perfect weather for cycling, just now in Scotland. Unfortunately, I haven’t been able to tempt Fat Mac on to his bike, so today I went searching for the Riggonhead Defile by myself. The Battle of Prestonpans took place on 21st Sept 1745. 271 years later to the day, by amazing coincidence rather than planning, I went cycling looking for the Riggonhead Defile down which the Jacobite army walked from Tranent, very early in the morning of the 21st, to outflank the British government forces led by Sir John Cope. Riggonhead Defile was a path through swampy ground which took the Jacobites down towards Port Seton, to the east of Cope’s army. I have an old map of the battle sites of Pinkie (1547), and Prestonpans (1745) on the wall in our front room, with a ‘line of march’ past Riggonhead faintly marked. There’s a clearer map here. Here is a print showing the Jacobites at the top of the Defile. This map seems to show the path. Here is a description of the battle which mentions a path through the marshland. Here is a nice interactive map. Last year there was a reenactment of Riggonhead March. I’m not sure where the reenactment went, last year, and there wasn’t a reenactment this year, or at least if there was one they had finished by the time I got there, but I couldn’t find the exact site of the original defile. The tracks have changed over the years, and there has been in the past a lot of shale mining in the area. The land is no longer boggy. According to my old OS map, the Defile should be to the right of the field shown above, or so. I cycled round the whole field, but fences stopped me getting down to Cockenzie. So I cycled back up through Tranent and along the Haddington Road, then took the first track to the left and ended up as above, but I think that this is to the east of where the Defile once ran. That track eventually took me down, under the ‘new’ A1, to Blindwells mine water treatment plant and then on to St Germains. Blindwells is mentioned in connection with the battle. One thing which surprised me when reading about the battle was the relatively small size of the armies. The number varies according to different sources, but there may have been about 2,000 Jacobite Highlanders. Cope’s army may have been larger (up to 4,000), though many were untrained raw recruits. The battle didn’t last long. Cope’s light, inaccurate artillery got off a few rounds and then fled, whilst his main body of men fired one volley, which didn’t stop the Highland charge, and then fled. Cope’s baggage train at Cockenzie containing £5,000 was captured, along with muskets and ammunition. Lessons from the defeat at Prestonpans were learnt by the government and when the two sides met in battle at Culloden seven months later, Cumberland had a much better trained force, able to reload and trained to withstand the Highland charge. At Culloden, the armies were larger but still relatively small. The Jacobites had been strengthened by French, Irish and Royal Écossais units, and sources reckon numbered about 7,000. The government troops were about 8,000. When you consider that, according to Trevor Royle, only thirteen years later in 1759 the Duc de Choiseul gathered an army of 100,000 in Brittany with a view to invading England, it makes the armies at Prestonpans and Culloden seem very small. Two fairly easy Munros the other day, up near the Drummochter Pass: Sgairneach Mhor & Beinn Udlamain. I was impressed with this geological feature. We saw a number of ptarmigan, many grouse and one hare. On that estate they set traps (legal) for predators.